Not as soft as other cotton quilts I have purchased but beautiful pattern and colors. Love the matching throw pillow! Add a stylish look to your bedroom with the Vivian Cotton 4-piece Quilt Set. This set features a soft cotton construction with cotton/poly fill and an eye-catching medallion pattern in pink and purple. All quilt and sham designs and colors are a random cut and not necessarily the same. The picture is only for reference. The material object may be slightly different. I purchased 3 of these sets for our girl's room. We have girls ages 3,7, and 10 and I felt this would be the perfect compromise to consider each of their styles and favorite colors, as well as not look too baby, or too teen. I was right. 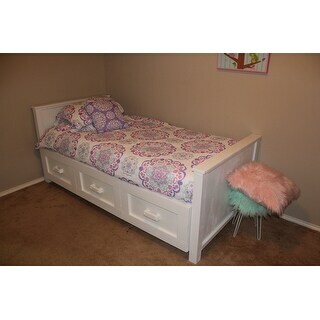 Thsee sets look great on our girl's beds. Everybody got a little bit of what they each wanted and because if the colors and pattern, it's something they can grow with. If I had to give a critique, it would be that the throw pillow says to wash before use but because it is stuffed and not a separate sham, I was to scared it would mess the fluff of the pillow up. Also, one of our throw pillows came with a small hole in the seam. No big deal, we fixed that quick. The only other thing I would say is that I personally would prefer if the decorative sham did not have the opening at the end, and would instead open in the middle. Only because it is hard to keep a thinner pillow inside and the sham looking good. I would just prefer the opening to be in the middle so that I could get that more "fluffed" look. Overall, I am so very satisfied with this set! Under $** for a 3 piece set, you can't beat it for a great quality set! 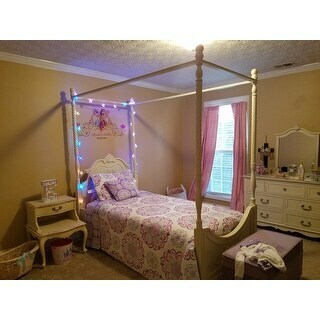 Even better, was able to redo my girl's room and spent less than $*** for 3 of these sets. My 6 yr old daughter loves her quilt. It is super cute and good quality material. We used the ice blue for her wall color and it turned out great...."Frozen inspired"
My 5 yr old daughter loves her quilt. She wanted a FROZEN theme room but I wanted bedding that would last when she outgrows FROZEN. The colors are beautiful and the quilt doesn't make her hot. After our first couple of washes it's holding up well. I wash it on cold and partially dry on low and then lay flat to dry. The colors are beautiful, the quality is excellent and the price was right on. I could not have purchased a better quality quilt for the price for my girls. This looks like a pottery barn style quilt for a fraction of the cost. The quality feels equally as heavy and the cotton is very soft at the same time. Well done. This quilt, sham, and decorative pillow set is adorable. It isn't as soft as I'd hoped, but I think a few washes and laundry softeners will have it perfect in no time. My 5 year old daughter loves it for her twin-sized bed. Sturdy, and well-made, it will be around for a long time! We ordered the Vivian Cotton 4 piece quilt set for my daughter's room. She loves it! The colors are rich and vibrant and the quality is there as well. The set washed up nicely and I dried it on Delicate. I didn't notice any shrinkage or fading. The Queen is also a good size. Not too short on the end or sides as some sets are. I would definitely purchase this brand again. Beautiful colors just like in photos. Was an oversized twin with extra throw pillow. Reverses to purple print. Cotton is very soft and price was outstanding for 4 piece set. Great for tweens. Beautiful colors and made of 100 percent cotton. My 9 year old loves her set. Great buy and would buy more in different colors in the future from the same company. Thanks to other reviews, I had a great idea of what to expect when my quilt arrived! The colors were exactly what we wanted and the quilt construction is extremely acceptable given the bargain price. The quilt is light weight, but the room my daughters share stays a little on the warm side, so for most of the year here in North GA, this quilt weight will work well with just sheets. We do plan on buying a coordinating blanket to hold warmth during the late Dec. through early March months. All my girls squealed when they saw me unbox the bedding. I bought 3 twin sets and can't wait to paint the room in a aqua color and get the redecorating done. I'll use two sets on twin bunk beds and one set on a day bed. The decorative throw pillow is very nice as well. Again, incredible bargain and super fast shipping! My daughter loves this. It was very easy to match, and is very easy to clean. Good quality, and is holding up great. We've been using it for two years now. We got this quilt set for my toddler to add to her new big girl bed. Wash first, has an odor. After one wash it was find. Daughter loved it, she said it's "fancy". Looks just like picture. A little thin, but super pretty!! Ok lets start with how beautiful this quilt is in person. I love quilts and this worked perfectly in my daughters room. I purchased two! The quality is nice, no bad smell and the girls love them. Love this reversible quilt. Used for my daughter’s bedroom. Got queen size for full bed and it draped perfectly to cover box spring and blankets. I only buy quilts now for bedding because they are so easy to throw in washer and dryer as needed. Good quality! I bought 3 for the triplets and they love them. The color stays vibrant after washing and the quality is excellent. Nice quilt set. Matches my daughters room perfect. Shipping was fast and item arrived on time and undamaged. Item washed and dried well. Highly recommend. Absolutely beautiful 4 piece girls quilt bedding set. The quilt is reversible, thick and durable. Looks fabulous in my daughters bedroom! Beautiful print. Excellent quality. Warm and stylish. My daughter loves her new bedding set. It’s feminine without being too “girly”. It washes so nicely, which is a huge plus. "I want this in a King size. Is there any way?" At this time, a king size is not available. "Are there any window treatments to go with this set? " It didn't come with any, unsure if available. I already had white ruffle curtains. No. Just Quilt, pillow sham, and small decor pillow. "Is this background color white white? Or off white?? " This quilt is white white. "When is this product going to be back in stock?" This set is expected to be back in stock at the end of May. "Is the background yellow or white?" It is white. My grand daughter loves this quilt. "Is this set still available in twin size?" It is simply adorable !!!!! My little girl is going to love it. Super cute print, grown up enough for Mom, yet still colorful and fun for my almost 5 year old. She picked this out for her new bed. Can't wait to get them delivered!